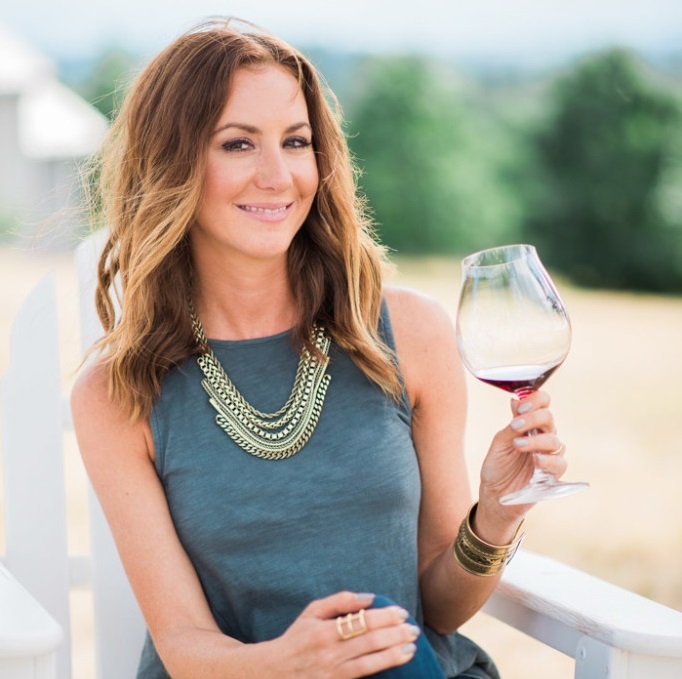 The New Year is going to bring a lot of exciting things my way – Starting off with a celebration in Paso Robles for my fiancee’s 50th birthday, followed by a trip to Mexico for my cousin’s wedding, and then in July, our wedding day will be here!!! Everything is happening so fast! Which means, I need to get a game plan in order. We met with a wedding planner and we are for sure and going to have help the day of our wedding now… It just seemed too crazy to tackle it all ourselves. I want to have fun and enjoy the night, not be stressing about all the details. I cut back my hours at my “real job” and now I’m only working 4 days a week, Monday through Thursday, leaving me with Fridays to work out all the wedding details, try on the dresses, and do all that fun stuff! I’m also hoping that I can squeeze in a few more workouts, start eating healthier, and take a bit of time just to breathe and destress. While (knock on wood), I’ve never had to worry too much about my weight, now that I’m in my late 30’s, I’m definitely starting to notice that my metabolism has slowed down a bit. Those extra glasses of wine and bowls of pasta seem a bit more noticeable on the scale now, and of course, I want to look the best I can for our big day. I squeeze in a couple of Barre classes during the week, and hop on the treadmill at home at least twice a week, but I think that where I really need to make a change is with my eating habits. It’s definitely hard because I LOVE to eat. I also get invited to quite a few media dinners where it’s just way too hard to pass on anything, and basically the entire menu is being served to you… So my game plan is lunch time meal planning. Lunch is the one meal that I can easily control – I’m usually eating on my own, and packing it into work, so as long as I have a healthy lunch packed, there’s no way I can really cheat. That’s where this Mediterranean Tuna Salad comes in. It’s protein packed, full of fiber, crunchy, tangy, salty and delicious flavors. It leaves me full until dinner time and I really do look forward to this salad every day. 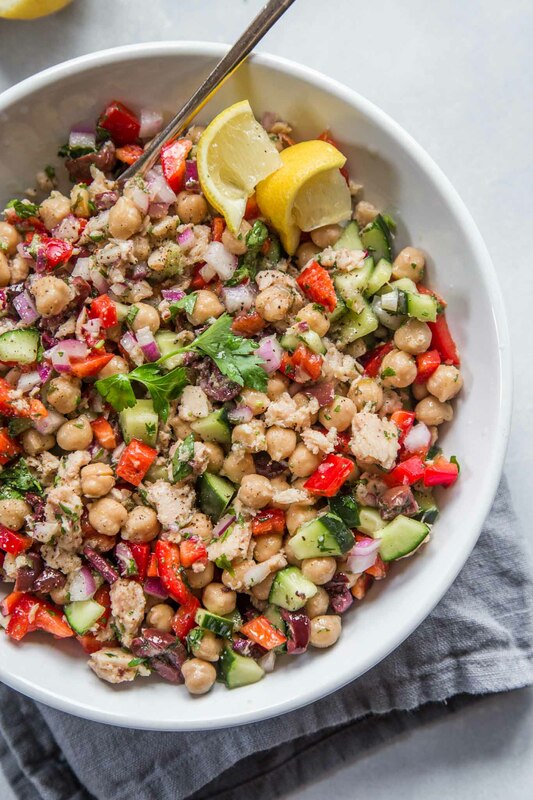 The dressing for this Mediterranean Chickpea Tuna Salad is light and delicious – lemony and garlicky. It coats the chickpeas and tuna perfectly and just blends everything together. 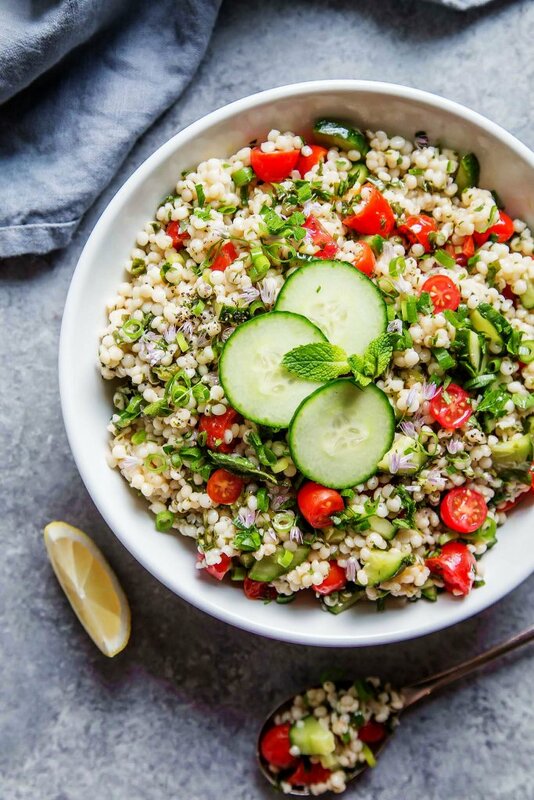 Plus, because this is a lettuce-free salad, you can make this salad on a Sunday and enjoy it throughout the week – It will stay fresh for 4-5 days in the refrigerator. How are you resolving to eat healthier in the New Year? I’d love to hear your tips and tricks in the comments below. 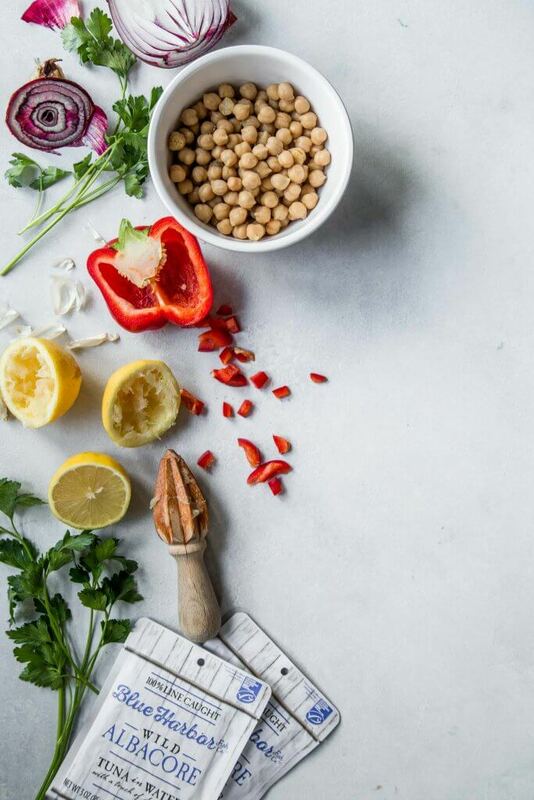 If you loved these Mediterranean Chickpea Salad recipe I would appreciate it so much if you would give this recipe a star review! Also, be sure to snap a picture of your finished dish and share it with me on Instagram using the hashtag #platingsandpairings and tagging me @platingsandpairings. 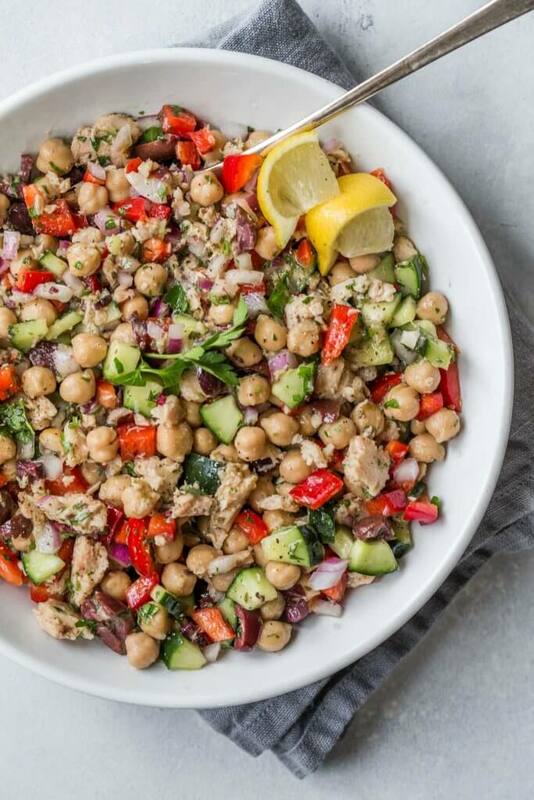 This Mediterranean Chickpea Tuna Salad is the perfect dish for when you’re trying to eat lighter but still want a delicious meal. 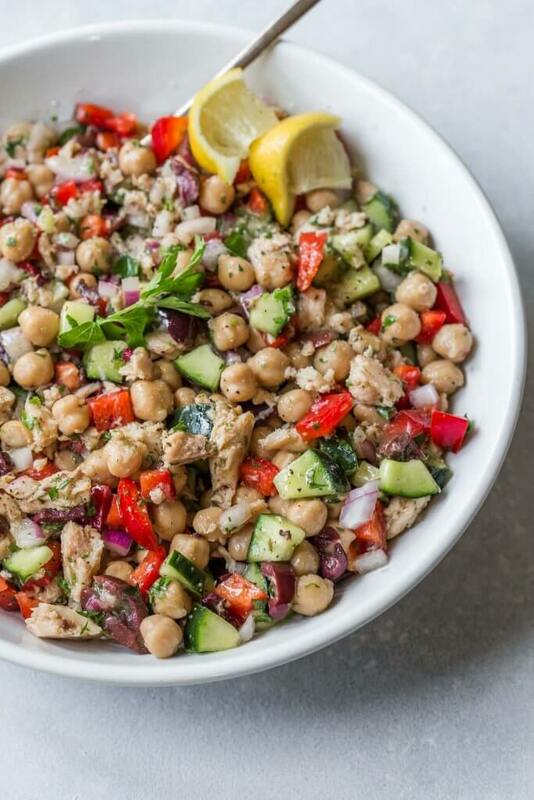 Flake the tuna into a salad bowl and add chickpeas, cucumber, red pepper, onion, Kalamata olives and parsley. Toss gently. 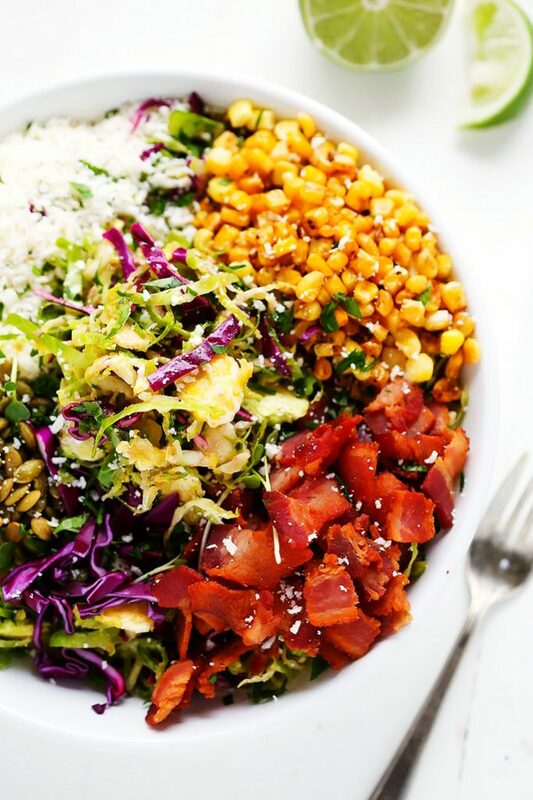 Whisk together the dressing ingredients and add them to the salad bowl. Toss everything together to coat and serve. Sauvignon Blanc will play nicely with fresh herbs and citrus notes in this salad. Another option would be a Pinot Gris. That’s so great you can scale back at work to “work” on Big Day details! Good for you. Spending some of that time taking care of you and your health by eating well and working out is a wonderful investment, too! First of all…CONGRATS on your wedding date and good luck with the planning. Glad you have some extra help with that now too and cut back on your work hours! All good things! I like this dish because it feels warm and summery even in the middle of winter. I don’t eat meat except fish so this recipe looks perfect, packed with both protein and vitamins. I havent tried Blue Harbor tuna packets but I will put them on my shopping list. Your pictures are always so gorgeous. My plan to be more healthy this year includes more smoothies and yoga…oh and sunshine! Gotta get that Vit D.
Thank you Danielle – I hope you enjoy! I’ve always loved tuna and chickpeas – this looks like a great salad! I’ve got some tins of tuna hanging out – I’ll have to make it. This recipe looks awesome, going to the store now! I have a question about the nutrition facts— the lack of protein it says this fish has? Only 1 gram even with the tuna? Also the fiber seems to be low with the veggies. Any thoughts? 1 gram of protein? Chickpeas and tuna are high in protein. I find it hard to believe that this recipe only has 1 gram of protein.